Securing referrals and sustaining those relationships with medical practitioners and providers can feel like a roller-coaster teenage romance. One week, you are seeing lots of referrals and having excellent interactions with the office’s staff (ie. the honeymoon stage). The next week, the office staff won’t return your calls and referrals have dropped off entirely (ie. the first fight). By the end of the month, you are back in the provider’s “good graces” and seeing referrals climb up back (ie. the make-up). But why does this happen? What can you do to weather the storm and see smooth sailing on the referral front? Feature a staff member in each month’s newsletter. Ask them to explain their certification or specialty and relate those skills to how they can help patients feel better. Over 80% of patients suffer from pain associated with their back or neck. And that pain often impacts other areas of the body or mobility functions. Saying that you treat back pain covers most of those conditions, but calling out specific diagnoses, symptoms, or syndromes that you treat can help a doctor’s office see you as a specialist AND a generalist. Write a newsletter or blog article on a specific condition that you see in a number of patients. Maybe you provide post-surgical rehab and see a lot of knee replacements. For example, our client, Teton Therapy, provides occupational therapy for oil field workers and is one of the few local clinics to do so. Network with action and support groups to build PR in the community. See if you can demo exercises at a local assisted living facility and be sure to network with the on/off-site doctors to build referrals. Or speak at a conference on orthopedic surgery to showcase your rehab to local surgeons and doctors. It is easy to get discouraged when you have reached out to the same office several times and are still not seeing referrals. Consistency is key in your doctor marketing. You can send 10 mailers and not see one referral. But, maybe the next mailer will focus on a specific condition, such as arthritis or shoulder pain, and that provider will feel a response to the marketing and start sending you patients. Refresh your marketing by adding in new topics to appeal to a wide range of providers. Do some competitor research on what other clinics are promoting and see how you can stand out. Don’t stop communicating even if you haven’t seen a single referral. Think of your doctor marketing as a sledgehammer and the door to the perfect referral relationship as a dam. You need to keep swinging the hammer to chip away at the dam, but once you break through—a flood of referrals will come. 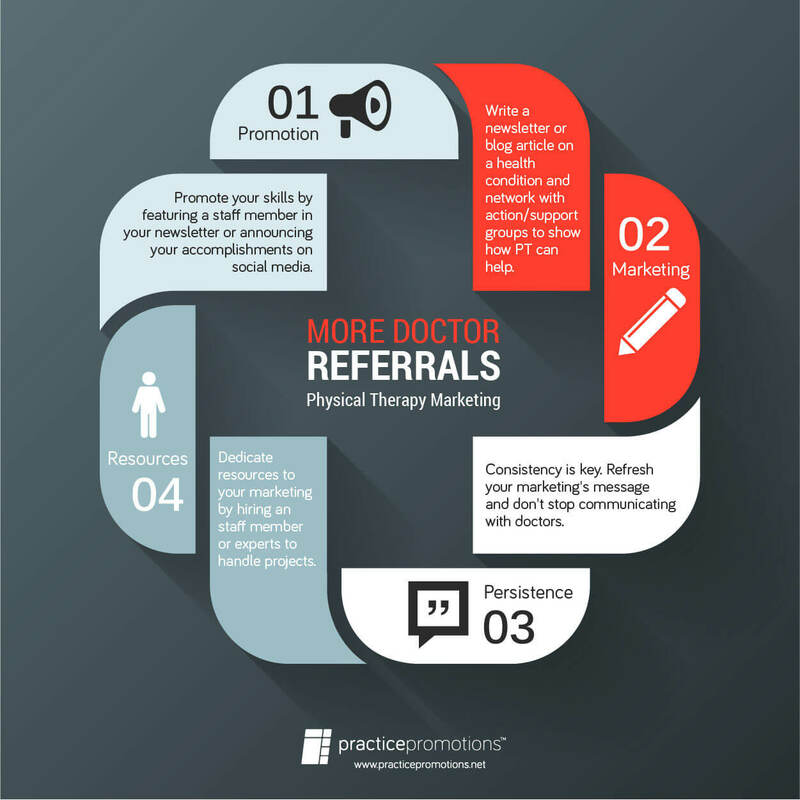 As the practice owner, it can become too much to try and run the clinic, see patients, and operate a successful referral marketing program. You need to be dedicating resources: time, money, personnel, and creativity to keep building relationships with doctors. Get a marketing guru and have him or her manage the doctor marketing and report back to you with the results. This might be a role that your current Referral Coordinator or VP of Marketing can take on as he/she should be routinely engaging with both the office staff and provider at referring practices. Turn to the experts who have years of business acumen and marketing expertise to help manage your doctor marketing. These marketers can provide a fresh perspective on what you are currently doing and how you can explore new options. At Practice Promotions, most of our account managers are former PT office staff and can help you by objectively analyzing and pinpointing areas to strengthen your marketing to sustain consistent referrals. Want more information on navigating referral relationships? Check out our physician referral system.